Yogyakarta is well known as the education city. It is showed with many places that are supporting about educations. One of them is Taman Pintar Yogyakarta. Do you know about Taman Pintar Friends? Yes, this is a place of science center. It is located in the center of Yogyakarta city. Easily, everyone can find this place. In Taman Pintar, we are able to do many things. There are appreciating, expressing, and creating. So we can improve our knowledge. There, the guests not only see the visuals (tools), but they can try, interact, and enjoy them. They can play and also get learn. Thus, the guests can feel how science is. Those activities will stimulate the guests or student’s minds to develop and conscious, if the technology science is very important for us. Hey, do you know how many main places in Taman Pintar? 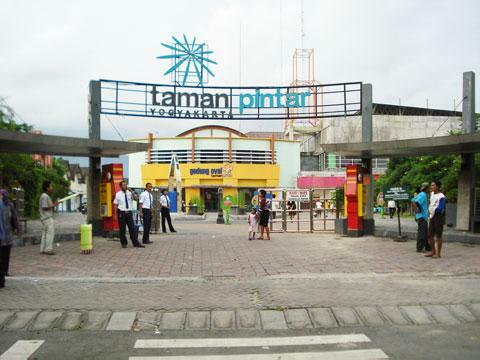 Yes, Taman Pintar has four main places. There are Playground, Heritage Building, Oval Building, and Square Building. From all of them, the basic place is Playground. It is a public place for the guests. In this place, there are a lot of interactive games and attractive visuals. The examples of the interactive games are Pipa Gaung, Air Menari, Parabola Berbisik, and Desaku Permai. Oh, they have eccentric names. You know, why is it given? Yes maybe, it is for attracting the students. So they will wonder to enjoy and try the games. Besides that, Taman Pintar has other facilities. There are show rooms, audiovisual room, food court, souvenir shop, mushola, and the information center. So, don’t worry, if you want to do something because we can get everything during visit that place.